The Parsleys, curled and flat-leaf alike, make themselves at home in our gardens every year about this time, if not a couple of months earlier. They are cool-season champions, rewarding the gardener in the kitchen and the landscape alike. Easy to grow, parsley of either kind is beloved of the beginner and the expert as well. Good garden soil, well-drained and with plenty of sun, wind, and water–occasional fertilizing with a slow-release organic product, and your parsley is off to a great start. Be sure to harvest the flat-leaf variety frequently to promote leaf production. Curled parsley is seen quite often as a border plant — its deep green color and lush growth make a dramatic accent around the edge of any garden. 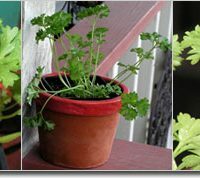 And flat-leaf or Italian parsley is equally easy to grow, has the best flavor of the two, and can even tolerate a certain amount of dappled or high shade. If it’s happy, it will re-seed and show up again next year.